As part of the study, I am taking students for 1 day trip at Photography Studio of a professional photographer Mr Inder Gopal at Shahpur Jat, Sirifot Auditorium New Delhi. He brings over 35 yrs of experience in Photography and have been trained and worked at Hannover, Germany (West) under Mr. Detlev van Eupen – van Eupen Werbe Fotografie. The objective of the trip is to understand and practice studio lighting techniques for Product Shoot. Students of BVA 2nd year and Digital and Communication 3rd Year will go. The total no. of students will be 8. Students will take care of transportation. Sharda LaunchPad Announces IDEA CENTRAL 1.0-THE BUSINESS IDEA PITCH COMPETITION on 16th November 2018. A shout out to all wannabe entrepreneurs who are in the search of the big idea!!! 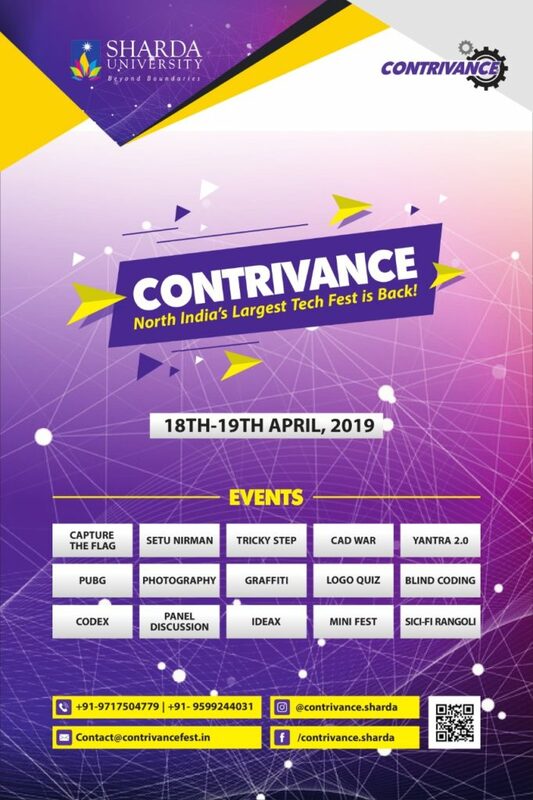 Sharda Launchpad proudly announces its flagship event called as “Idea Central.” A new outlook, a new opportunity always exists. Find it, shape it, refine it and join us for “Idea Central 1.0,” Competition 2018. Welcome to ‘Idea Central’ that focuses on business ideas that show the spark to rule the world and create opportunities in business as well as social space. Attractive Prizes to be won!!!! Start-ups that have just developed a prototype/conducted a pilot are eligible to participate in the Idea Central 1.0 2018. (You will be required to submit proof of the same during the competition process.) Don’t be disheartened if you are still in the idea stage. You are also welcome to present your idea. The event is open for all wannabe or existing entrepreneurs. Teams that may comprise of students, corporate professionals, entrepreneurs as well as other independent individuals (employed or self-employed). Sign up for the event by sending an email to deepa.kumari@sharda.ac.in or swati.oberoi@sharda.ac.in by the 14th of November, 2018. B. Tech. (3rd Year ) Mechanical & Automobile Engineering Students will be Visiting Companies Any Packaging, Precision Polymer, Eco-Vision, Mold Spec, Innocolor, Surajpur, Gautam Budha Nagar, UP, on 16th November-2018 (Friday) as part of the Community Connect Industrial Visit Programme. The Department of Mass Communication, School of Creative Art, Design and Media Studies (SCADMS) is organizing placement drive for the final year students of BA(JMC) and MA(JMC) on November 16, 2018. A recruitment panel of India’s leading Zee Digital will be in the department for the selection of the students on the basis of their knowledge and skills. The department wishes good luck to the students. Placement of the final year UG and PG students in Digital Media Industry. 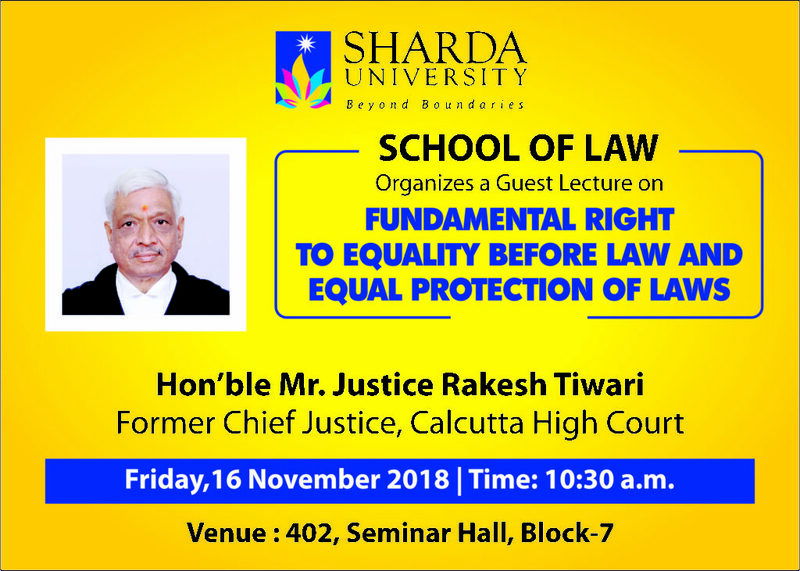 School of Law, Sharda University is Organizing Guest lecture on “Fundamental Right to Equality Before the Law and Equal Protection of Laws” on Friday, 16th November 2018. To expose students to case laws on Right to equality. To enhance Student’s educational experience. Hon’ble Mr. Justice Rakesh Tiwari, Former Chief Justice, Calcutta High Court. “ROBO_TREEE” a Technical Club will be launched in Electrical and Electronics Department, SET to promote innovation project concepts among the students. With this objective, we are inviting members of the faculty, who wish to contribute to this task, from all Department of School of Engineering & Technology. Students will also be invited to become members. 1. The membership of the Club will be voluntary and open to both faculty members and students. 2. The students will be exposed to study of various areas like embedded system, Industrial robotics. 3. The students will be guided to participate in university and national level technical competitions. 4. The developed work of students will be published in indexed journals and university journals. 5. Workshops and offline courses will be conducted for students and faculty members. All interested faculty members are requested to attend the inaugural function of club today Nov 16, 2018 in 221 B1, Advanced Instrumentation and Automation Laboratory, EEE Dept. at 2:30 pm. To promote innovation project concepts among the students. 2nd Journal Club Meeting- Department of Mathematics, SBSR- November 16th, 2018. Abstract: Galileo Galilei (1564-1642) had declared “Mathematics is the language of nature”. He had emphasized that Mathematics reveals the secrets of nature. In the recent past, it has been visualized as the mother of all technologies. Some branches of Mathematics, namely Fourier analysis (including Haar function, Walsh function), differential equations, variational methods, inverse problems, wavelets and fractals have played very significant role in the development of several emerging areas of science and technology. Several Nobel prize and Abel prize winners have worked in these areas. The speaker and his academic collaborators within Sharda University and outside have made valuable contributions which have been published in books and journals of reputed publishers such as Springer, Springer Nature, Kluwer Academic publishers, Elsevier, Marcel Dekker, Taylor and Francis, American Institute of Physics, CRC Press, Longmann and World Scientific. The main goal of this talk is to familiarize students and faculty members of Sharda University about these scientific achievements. Venue: Conference Room, Business Incubation Centre (Block 1, Room No. 111). A credit system is a systematic way of describing an educational programme by attaching credits to its components. An academic credit system is a standard used by universities to measure and assess students work and effort during their Bachelor, Master or PhD programme. The Objective of the event is to provide a platform for discussion on credits of student workload, learning outcomes and contact hours. Internal Quality Assurance Cell (IQAC) in association with Organizational Development Team -Sharda Skills is organizing a two-day training program for Support Team of IHA on 17/11/2018 and 22/11/2018. Objective of this training program is to cover the customer satisfaction management fundamentals, the moment of truth theory and understand the service competencies so that the participants can improve customer satisfaction. School of Architecture and Planning (SAP) Sharda University is organising a visit to five villages under the open elective programme of ‘ Rural Research & Development’ on November 17th. The visit aims to expose the students to the rural context and issues. The students will survey and document these villages in groups. The students will learn to observe the community participation in rural context. They will identify the issues related to rural development and propose solutions to the issues. Department of Life Sciences, SBSR is organizing Journal Club Activity to discuss on ‘Innovative Extraction Technologies in Food Processing‘. To discuss the novel technologies for extraction in food processing. Department of Design, School of Architecture and Planning (SAP), Sharda University is organizing ‘Parent Teacher Meeting (PTM)’ on 17th November, 2018 (Saturday) to discuss the attendance and overall performance of the student. It is an important occasion, as such interaction are necessary to fill the communication gap between the teachers and the parents, such parental interaction not only allows the faculties to share the students progress with their parents but also enable the faculty to learn about the students’ development at home. This practice helps both the teacher and the parent to ensure a balanced growth of the student, personally and professionally. School of Languages and Culture (SOLC) Sharda University is organizing ‘Parent Teacher Meeting (PTM)’ on 17th November 2018. Parents of students are cordially invited to attend the PTM to discuss with teachers issues regarding attendance & academic performance of their wards. A student visit of B Tech (3rd year) and M Tech (Env Engg) students is being organized to the Greater Noida Sewage Treatment Plant in Kasna on Saturday, Nov 17. The student will get to learn the operation of a large scale STP (126 MLD) and the automation involved and the problems encountered in its day-to-day operation. There will be two shifts of the visit starting at 9:30 am and 12:30 pm.